During the winter season CGN pleasure boat cruises on Lac Léman are limited to ferry boats, fondue dinner cruises, and sailings on Sundays. Departures are most common from Geneva, Lausanne, Vevey and Nyon. Cruising on Lake Geneva has been popular with tourists in the Lac Léman region for well over a century. Many boats sail on Switzerland’s largest lake during summer but in winter cruises are limited to a few departures from Lausanne, Vevey, Nyon and Genève on Sunday, fondue dinner cruises on Friday, and short ferry boat rides between Lausanne and Evian or Thonon, as well as Nyon to Yvoire. 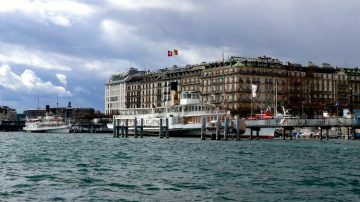 The winter season for boat cruises on Lake Geneva in Switzerland is from late October to mid-April. New Year’s Eve dinner cruises depart from Geneva, Lausanne, and Haut Lac towns. Pleasure cruises on lake boats on Lac Léman during the winter season are fairly limited. Standard sightseeing boats cruise only on Sundays and national holidays during the CGN winter timetable period – end October to mid-April. Ferries operate on Lake Geneva year round but in winter some routes are on weekdays only. It is usually possible to embark or disembark at any port and the purchase of food and drinks is usually optional. 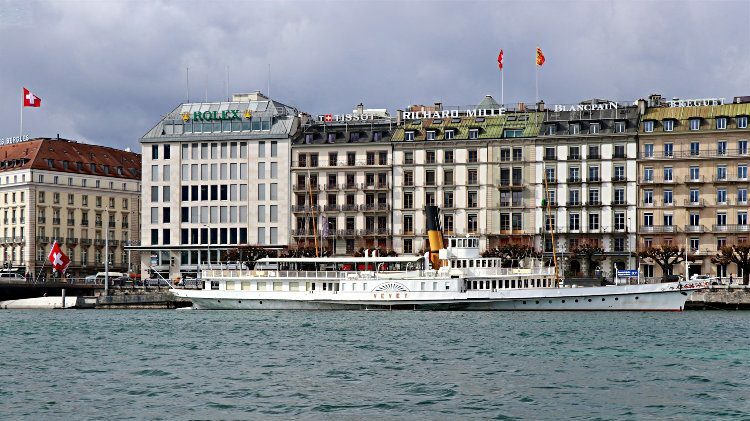 In winter, diesel rather than the Belle Epoque steamboats are mostly used, although the diesel driven paddle wheel MS Vevey is often used on departures from Geneva and the similar MS Italie from Lausanne. The Captain’s Table (La Table du Capitaine) – a lunch-hour cruise from Genève to Nyon lasting around 80 minutes with stops possible in Versoix. A lunch main course is usually included but not dessert of drinks. On winter Sundays, CGN boats depart on several cruises in the Upper Lake (Haut Lac) region of Lake Geneva. This part of Lac Léman is generally the most beautiful and is also easily accessible from many winter sport and ski resorts in the French and Swiss Alps. Usually three cruises per Sunday complete the full circle of the upper lake area between Vevey and Montreus / Chillon / St. Gingolph. It is possible to board at any stop and do the full circle if desired – the cruise number may change en route but it is usually not necessary to change boats. These classical circular cruises – currently termed “At the heart of the Heritage” – sail past some of the best scenery in the Lac Léman region: the vineyards of the Lavaux, Chateau de Chillon, and the snow-covered Alpine peaks permanently in the background. Stops usually include Vevey-Marché, Vevey-La Tour, Clarens, Montreux, Territet, Chateau de Chillon, Villeneuve, Le Bouveret and St Gingolph. A full circle takes around two hours while the Vevey to Chillon part of the route is just less than an hour. Lunch is optional. The Captain’s Table in the Heart of the Heritage (La Table du Capitaine) is a classical lunch-time cruise and the only option, other than passenger ferries, from Lausanne during winter. 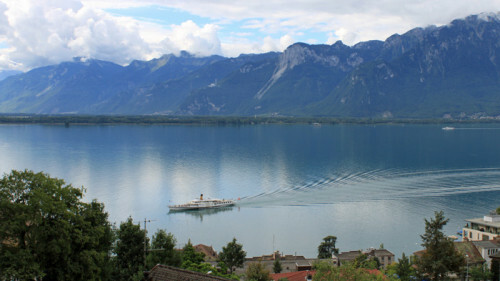 Currently, the Italie Grand Epoque paddle boat is used for this cruise from Lausanne past the vineyards of the Lavaux and Montreux to Chateau de Chillon, Lausanne to Chillon takes around two hours in each direction. This cruise boat departs from Lausanne-Ouchy and stops en route at Pully, Lutry, Cully, Vevey-Marché, Vevey-La Tour, Clarens, Montreux, and Territet before arriving at Chateau de Chillon. Lunch is usually included in departures form Lausanne and Vevey but snacks are optional on cruises towards Lausanne. Lunch is served during lunch-time cruises and smaller snacks for afternoon departures. Lunch is usually optional and charged for separately. Passenger ferry boats operate on Lac Léman as part of the public transportation network in the Lake Geneva region and thus continue to sail during the winter. 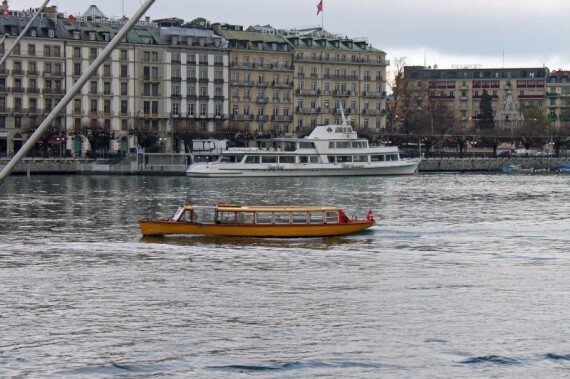 Apart from the Mouette water buses in Genève these ferries are often the only way to sail on Lake Geneva during winter. During winter, most of the routes have only ferry services on weekdays. The schedule is very limited – often only with services during peak commute times, which can be very inconvenient for tourists so double-check schedules before setting out. The Lausanne-Evian-les-Bains route is the busiest and has boats departing every day even during winter. These ferries are a good cruising option in winter when no other boats are on the lake. A special deal for breakfast is available from Lausanne where passengers enjoy a light breakfast on a cruise to Evian and back without leaving the boat in France. No car ferries operate on Lake Geneva – it is a long, slow drive to much of the French side of the lake. Fondue dinner cruises have long been popular on Lake Geneva during the autumn, spring and winter cruises seasons. Dinner cruises on Friday serve Swiss cheese fondue and sometimes Chinese fondue too. Fondue dinner cruises depart from Geneva and from Lausanne. 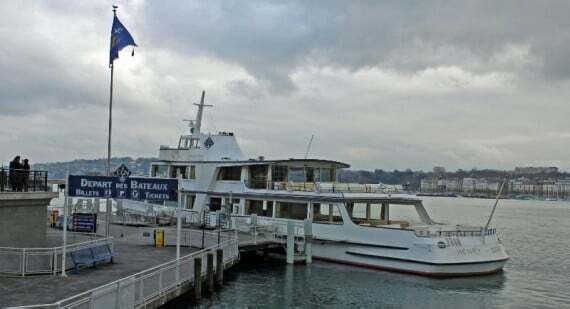 The Lausanne cruise also stops at Morges and connecting boats are available from Evian. These dinner cruises are around two hours but the best value is available from Lausanne. It is possible to go onboard at Lausanne-Ouchy at 8 pm and disembark at 10 pm, or take for free the return trip to Morges to disembark at Lausanne after 11 pm. The fondue cruise price is around CHF49 for the cheese fondue or CHF67 for the Chinese fondue. (These prices are in line with regular Swiss restaurant menus.) The fondue is all-you-can-eat but excludes drinks. Reservations are required.